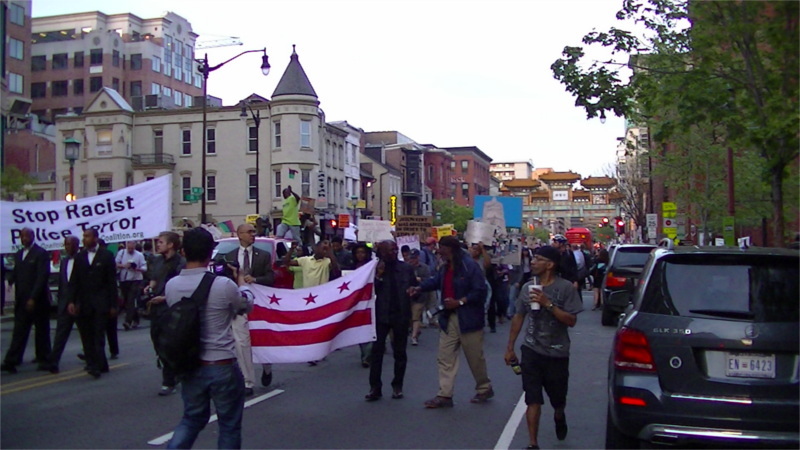 On the 29th of April, a huge Baltimore Uprising solidarity march issued forth from Chinatown. This march visited the Wilson Building (DC's city hall) and the White House. At the White House, the security lights behind the fence were turned on for the duration of the protests, something that used to be exceedingly rare and reserved for things like fence-jumpers and suspicious packages. 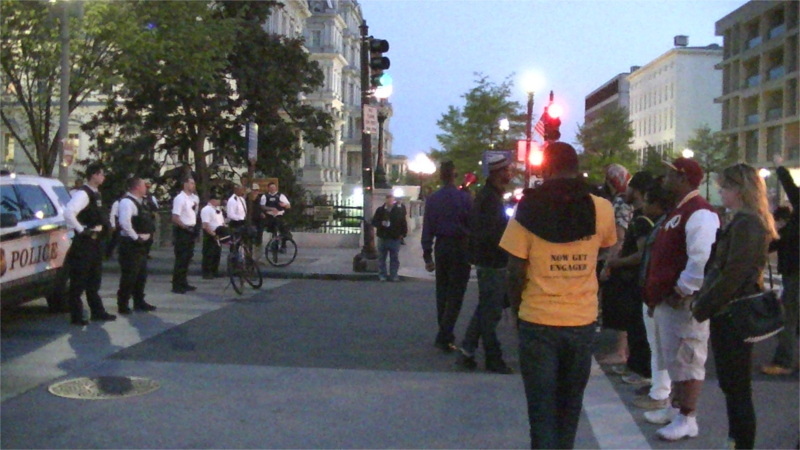 On the 28th of April, as the curfew threatened peaceful protesters in Baltimore, solidarity protests began in DC. Protesters marched on the White House, only to find Obama's answer to the Question of Baltimore was to barricade the White House. Later a surprise "pop-up" protest blockaded 14th and U sts, and grew over time as bystanders joined in to reinforce the blockade. 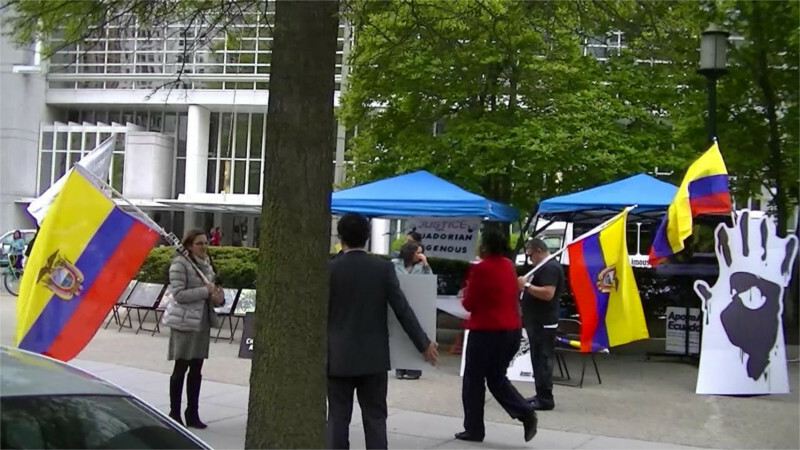 On the 27th of April, Ecuadorians showed up in front of the World Bank to protest Chevron's counter-lawsuit against Indigenous communities harmed by oil spills before the International Center for Settlement of Investment Disputes (ICSID). The ICSID is a member of the World Bank Group.Chevron is seeking by counter-lawsuits to evade paying the judgement against them for their oil spills that have given Indigneous children cancer. 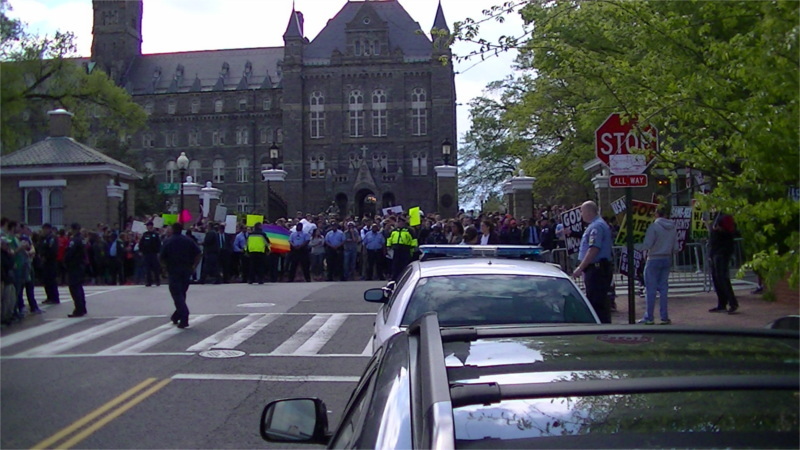 On the 27th of April, Westboro "Baptist," a hate group notorious for their funeral protests and hatred of GLBT people showed up at Georgetown University. They had a permit to be there for an hour but chose to leave at least 20 minutes early after having their message of hate drowned out by thousands of counterprotesters. On the 25th of April, a massive protest took to the streets of Baltimore demanding justice for Freddie Grey, whose spine was broken by Baltimore police. 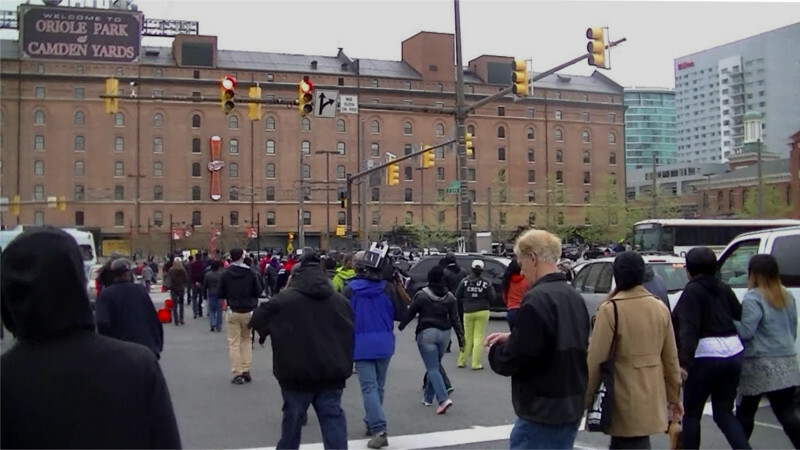 Both before and after the City Hall rally, protesters marched on the baseball game at Camden Yards. Due to the protests, police "advised" baseball fans to remain in the stadium. Until at least 6PM it seemed this huge protest was able to chase Baltimore's killer cops right off the street. After that things got rough. 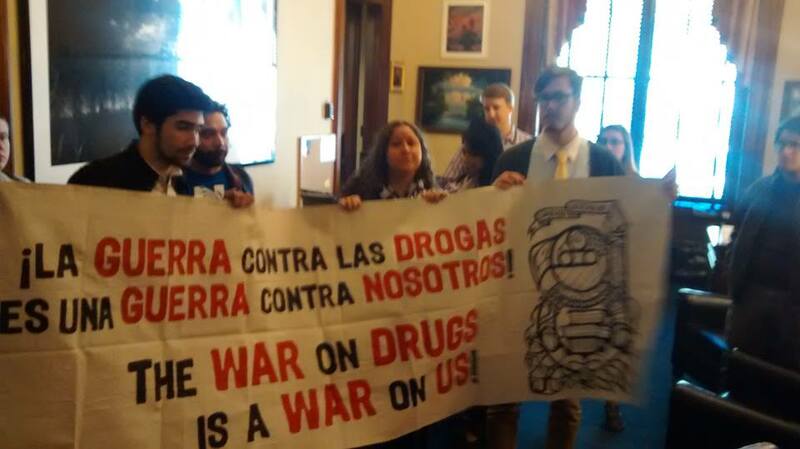 On the 24th of April, School of the America's Watch activists culimnated several days of lobbying with a direct action protest inside Sen Marco Rubio's office, calling him out for failing to oppose the failed "war on drugs" that has caused spiraling violence violence in Mexico and elsewhere. 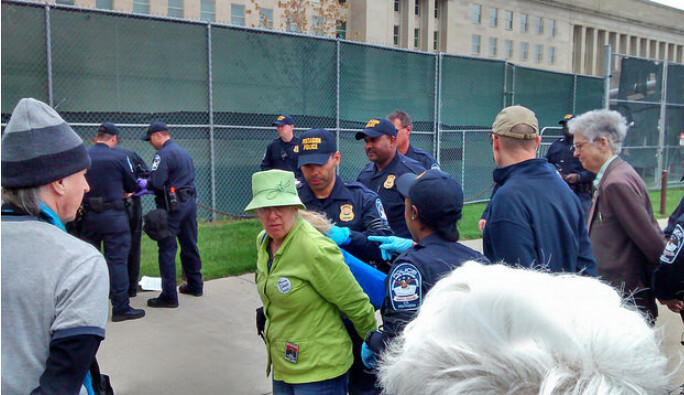 On Earth Day, the 22nd of April, antiwar activists showed up first at the EPA and then at the Pentagon to condemn the huge usage of fossil fuels and massive pollution by the US military. Eight of the protesters were arrested at the Pentagon for leaving the so-called "free speech zone" to deliver a letter to the Pentagon and request a meeting with Pentagon officials. 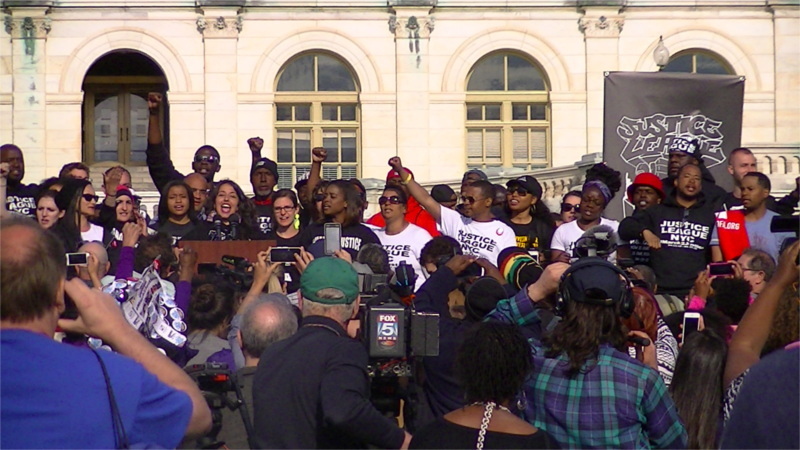 On the 22nd of April, hundreds of striking janitors,cooks, and other workers from Federal contractors marched on the US Capitol demanding $15 an hour and union representation. 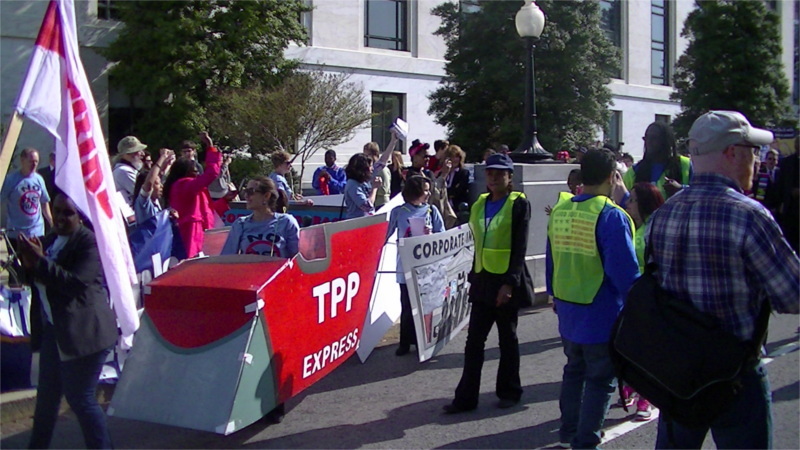 They were joined by a second group of activists protesting the TPP "fast track" bill that would allow any TPP deal a no-amendment, minimal debate up or down vote on a simple majority when most Senate business requires 60 votes.